Summer is a great time to get out of the house with your toddler. However, with only a month left to go, you may be struggling to come up with new and exciting ways to keep your child entertained. 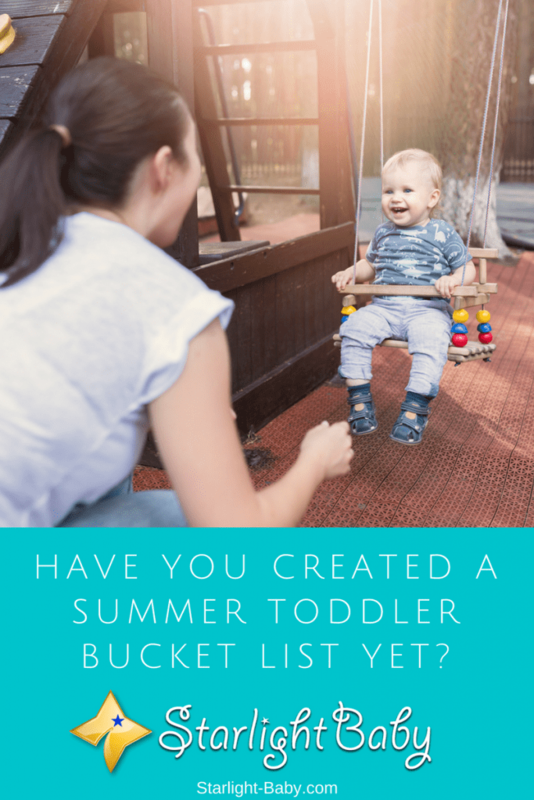 One way to ensure you make the most of what is left of the hot summer days is to create a toddler bucket list. Not only does a bucket list give you plenty of ideas of what to do with your toddler, but it’s also fun to tick off the activities as you go along. You can add as many things to the bucket list as you want to. So, what exactly is a toddler bucket list and what kind of things can you add to it? What Is A Toddler Bucket List? Bucket lists are nothing new, but they’re typically used as a “list of things I want to do before I die”. So, they usually include big things such as swimming with dolphins, skydiving and visiting various destinations around the world. However, there’s no rule saying you can’t use a bucket list for other things in life. In fact, it can really help you to ensure you achieve everything you want to within a set period of time. Toddler summer bucket lists for example, are becoming really popular and that’s because they’re helping to fend off boredom and help parents make the most of the summer holidays with their little one. It’s basically a long list of things you want to do with your toddler before the end of summer. As you complete each activity, you cross it off the list. So, what kind of things should you put on the list? If you’re struggling, below you’ll find some great ideas for inspiration. While summer is generally hot and sunny, it’s important to ensure your list incorporates both indoor and outdoor activities. That way, if there is the odd rainy day, you’ll still have plenty of ideas to work with. Then, add as many activities as you can think of to each category. That way, no matter what the weather is like or what you both feel like doing on any given day, there will be something to fit your requirements. Outdoor Exploration – Outdoor play is vital for a toddler’s development, and what better way to channel their natural outdoor enthusiasm than with exploration activities? Just some of the things you can add to this list include heading to the beach, going to the park, heading off to the zoo and going on long walks. Each of these activities allows your toddler to discover new things. Whether it’s wildlife watching, or having fun making sandcastles on the beach – outdoor exploration is a must for any toddler summer bucket list. Outdoor Activities – Of course, you don’t even have to leave your back yard to help your toddler enjoy the outdoors. There’s plenty of fun summer activities they can take part in wherever they are. Think sensory play activities for example. Any outdoor activity that incorporates water into the mix will go down well and help to keep them cool on hotter days. You could also create your own outdoor teepee – how fun would that be! Painting and toddler gardening are also fab ideas. There’s literally no end to the amount of summer outdoor activities you can try out. Why not look online for inspiration? Indoor Activities – There’s a lot of fun indoor summer activities you and your toddler can do. Whether you need to stay home to catch up on chores, you want to keep your little one out of the sun for a while, or the weather isn’t great – put together a list of activities which can be done indoors. Just a few ideas include making your own ice cream in freezer bags, having an indoor picnic, dressing up and having a blast with indoor bowling. Group Activities – Even with a long list of indoor and outdoor activities, if you don’t get out and socialize with others, you’re going to start feeling like you’re going insane. Socialization is also important for your toddler’s development, so take a look at the different group activities available in your area. You’ll find there’s typically a lot more toddler groups hosted during the summer, so you shouldn’t have trouble finding something to suit you and your child. You might just be surprised by the number of different groups available. You can also get out and socialize with others by going to community events. Again, summer is prime time for local events and simply getting out with your toddler without having to directly participate directly, can be great for the both of you. Finding inspiration for activities to add to your summer toddler bucket list is easy. However, the purpose of a bucket list is to ensure you do the things you really want to do. So, when creating the list, consider what your main goals are. Do you want them to learn new things? Is there something you don’t usually get time to do with your toddler that you could do in summer? Ideally, you want to try to come up with ideas you can’t usually do at any other time. So, spend a little time thinking about the types of activities that would best fit your goals. Overall, a toddler summer bucket list is a fantastic idea and it can really help make the summer months much more interesting. You and your little one will have a lot of fun, not just doing the things on the list, but ticking them off too. So, if you haven’t yet created one, now’s definitely the time to consider doing so. You are right that bucket lists are almost always associated with the things you want to do before death. I honestly didn’t think about bucket lists in such a way. That is really clever! I am definitely making one tomorrow when I have free time. Do you think that it is a good idea to try and make this bucket list with the help of my toddler? Sort of create it together? That way we can also do things that he wants to and enjoys. Either way, thank you again for the amazing idea to keep my boy busy even in the summer days. I hope both of you will have a good time! This is really a good dimension to having unforgettable experience with the kids during summer. though I rarely pen down any activity because I just allow things happen naturally I.e making do with activities that crosses my mind. I have never tried to do a bucket list as well, augusta. I do believe now is the best time to create one 🙂 And do include your kids in the planning. I’m sure they will have lots of ideas for the list, and you’re assured they’re also interested and excited about the activity. Great insight here, you just opened my eyes to different ideas for this summer. Planning and setting goals by writing them down is very important in anything someone wants to achieve. The common thing most people does is to store the things they want to execute in their brain but it’s always forgotten. Many parents have plans this summer for their toddlers and the best way I think to make it easy is through what you’ve just explained above by having a summer bucket list. This summer, I want my kids to learn new things and at the same time have lots of fun. My thoughts exactly, Gettingmile. We do have a lot of summer activities in mind but if we don’t write them down, we tend to forget them, and never get to carry out the plans. Before we know it, summer’s over. So go ahead, write it down, and have lots of fun with your kids. Create memories they’ll remember for a lifetime. I will start saying that me and my toddler enjoy outgoing activities a lot but we don’t like doing group activities and this might harm him in the social way. I will be more careful with him and take him with me and any group activities coming up. Taking them to a zoo. Children are always fascinated with animals. Taking them to a nature walk. Children love plants, flowers, birds. Setting a children pool in the house. Children love having fun in the water. My parents never used the toddler bucket list for me and I must say that it is something that I really missed while growing up. I never heard what toddler bucket list was all about, but as I read your article, I could recall that my parents never had a communication with me on where I want to go have fun during those days. I will certainly ensure that my future kids will enjoy almost all they wish for while still growing up. Summer is here and I have not made any bucket list. A couple of weeks ago we took our baby to a children park. It was the first time when we took the baby to the children park. He just loved. If I make a bucket list visiting a children park will definitely added on the list. My baby also enjoys playing in the water. Buying a kiddie might also be included in my bucket list.